Sit tight guys, those jetbikes aren't coming over here. In the past week, I've heard more people refer to the Capture and Control mission as the "auto-tie" mission than ever before. How in the world did we get to this? Can someone please tell me how we get to the point that we believe/think/feel that the Capture and Control mission should be more appropriately named the "Auto-tie mission." That's like showing up to play and telling your opponent that you're going to make no effort to win the game, you're just going to sit here contently on your side of the board with your own little troops and hope that he does the same thing so you can both walk away feeling like you've done your best. Is the mission really that hard that you can't figure out a way to try to win? Even with a legal list (and my non-legal one as well), I have two troops choices and I can still win this one most of the time. Maybe its me, maybe I'm missing something. I think it's the internet and the lists out there that people use in hopes of being able to pull off some killer combo or get first turn or whatever it is for the week. I think people have all but stopped playing the missions and instead look at their own army and think... "If I do this and then this and then that, I will crush my opponent." But they do all this planning in a bubble. They don't account for the dice, they don't account for the terrain on the board, they don't account for first turn, they don't account for their opponent's deployment and most of all, they don't account for the fact that their opponent is trying to stop them from doing it all together! All the time, I hear people say how this unit or that unit is cable of dealing this much damage or moving this far and how nobody can stop it. But what about the mission I ask? And I get funny looks. But what about your opponent I ask? More funny looks. When did we start building army lists without taking into consideration everything else? I'll give the themed army players some leeway here, they're building a list based on a particular theme, time period, fluff, bit of background and they make their unit choices accordingly. But even they try to win sometimes. I just can't believe that GW would make a mission that nobody will even try to win at and the general consensus is that the best you can do is tie. Is this mission left out of tournament play because nobody can win at it? I have an idea, make this one the final mission played between the top two players at every tournament. The player who can win this one must certainly be the best. Sons of Taurus covered this topic a few months ago and also believes you can win this one. Give his post a read to see how he thinks it can be done. Not only do you have to accomplish your own objective, you have to stop your opponent from accomplishing his... and most times, the two of you have completely different objectives. "Rules of Engagement"! That's what it is called. I've been recycling these rules around my club for the last two years and their origins got lost in history. Thanks for posting! Anyone who says any mission is an "auto-tie" mission really doesn't get this game. Besides, in my group we don't believe in a "tie". If the objectives were tied, we go to victory points. If we both had a the EXACT same number of VPs, we roll off. With only two objectives on the board it is very easy for opponents to prevent you from controlling either objective. Especially when balanced all-comer lists are used. "I have an idea, make this one the final mission played between the top two players at every tournament. The player who can win this one must certainly be the best." They will just end up with ties... or it will come down to luck. Someone will take a risk and it will either pay off or it won't. And that isn't a measurement of who is the best. Tournaments like NOVA Open and Battle for Salvation have multiple objectives to ensure that there are no ties. If you both achieve primary objectives it goes to secondary. If both made secondary it then goes to tertiary (which is usually battle points). I'm sorry, but I think this post is just wrong. How do army lists figure into this mission? A good army list is built to handle the 3 mission types. If anything, KP's figure into list building far more than the 'Roll Dice and Tie' mission type. Nobody plays this mission and 'tries not to win,' that's ridiculous. But it seems obvious that an odd number of objectives means a mission is much less likely to end in a draw. I understand that GW never really makes mistakes, and if something doesn't work out right it's surely the internet's fault, or the players fault. This is GW we're talking about here- look at the Perfect Tournament System that is Throne of Skulls! Or those excellent missions for 'Ard Boys! These are the people who wrote the Tyranid FAQ. They are incapable of fail, right? Right. I'm also sure that the Tyranid player who went second, and drops Deathleaper on his opponent's objective on the last turn (or some similar scenario with a different army), would most certainly be the best player at that Tournament. The sentence about people not thinking about dice and terrain etc etc is one of my main beefs with internet and 40k. It really winds me up when people say they will table someone elses list by turn 2, they do not factor in moves to get LOS, dice rolls etc etc. Anyway, I've found capture and control with spearhead is auto tie - reason is we both put them in the far corners of the board. Can be taken by outflankers etc but it's possible to fight those off. Getting troops diagonal across the board can be a problem. The folks who are thinking in a bubble usually get crushed when they go to a large tournament -- the better tournament players design their armies to allow for all of those factors -- i.e. they include flexibility to allow for the peculiarities of mission, unexpected actions of their opponent, etc. Agree that "auto tie" is a myth. It's not so much that they play not to win, rather they play not to lose. Same net effect though! Inquisitor: There you have it then... a bit of history for your group. Messanger of Death: I don't know if I agree with having "only two objectives on the board it is very easy for opponents to prevent you from controlling either objective." I think it can most certainly be done, but I will agree that doing it against an all comers list can be harder than a tailored list. I can appreciate other gouprs like NOVA Open and Battle for Salvation going the extra distance to make sure things like this are minimized in the events they put on. SinSynn: Don't apologize. I rather hear what you all think than to not hear it. I think an army list figures into all missions. Depending on what you took will determine what you have available at the start to accomplish the mission. You'll have to look at your force and figure out how best to use all the pieces given the mission you're presented with. KPs also figure into your list. Just like the number of Troop choices and everything else. I don't see how it can't figure into missions honestly. I do agree that sometimes GW falls short in shall we say producing top notch rules/missions/etc. Perhaps this is one of those times. But what's worse, GW failing at it or the 40k community quitting at it? And BoLS?... you cut me deep. I kid, thank you for commenting. Mercer: I agree. How can you table me by turn two based on what you know only about your list. I find that crazy. I like to talk trash with the best of them (just ask anyone in my gaming group), but that's way over the top even for me. Hudson: You're right, more of the outside the buybble thinking would do us all some good. Flexibility is a huge factor in my army. Both in unit choice (although I tend to take what I want based on looks) and in using them on the table. Sons of Taurus: Playing not to lose... I wish I'd sdaid like that. Can you imagine telling your opponent that? "Hey dude, I'm not here to win, just not to lose. Good luck." And thanks for sharing the link, I'm adding it into the post. Well I played that scenario last weekend, and it ended in a tie. My outflanking unit showed up on the wrong side of the table. A hellhound & banewolf, backed up about 30 odd guardsmen of various types, advanced on the enemy objectives but twin demon princes with wings & a bunch of plague marines made short work of them. Meanwhile said demon princes & plague marines got close to my objective, crested the hill in front of it, and the heavy weapons gun line (and basilisk) slaughtered all before them (his deep strikers mishapped & I put them as far from objectives as was possible). In the end it was the usual bloody brutal game, but don't tell me that because it was a tie, I wasn't trying to win. Making that assumption is no better than the demonized pervading net attitude you mention. That said, locally we have a two Necron players who are notorious for advancing nothing but a C'tan in this scenario, effectively playing for a tie @ best from the outset. I think that THAT mindset is where 'auto-tie' concept comes from (The Independent Characters podcast uses the term a lot too, which doesn't help). Cheef: I will not fault a guy for going for the win. It sounds like you had the usual run of luck with some things working out and some things going as bad as possible in your game... for both players. And I'm certainly not saying or assuming that games that end in ties (any game) means the players aren't trying to win either. I just can't wrap my head around the whole "auto-tie" concept and the people that call it like that and maybe worse yet, play it like that. I would be dissappointed if my opponent played it like that against me. I find when playing it opponents dare not commit enough troops to grab your objectives. I run a Kan list with two KFF, I leave a squad of grots and some lootas on my home one and send my Kans/boyz/meks/dreds to work on the away one, if I draw I want to have at least claimed the away one! Net result though is if I deploy first my opponent gets the sweats at my aggressive setup and sits there entire army on there home one and commit a unit to claim mine. The point is it is easy to draw this mission, but that is purely on the mind set of the player not wanting to lose. Personally for me its a game if I draw fine, if I lose fine, if I win kerrr ching. And no I'm not a win at all costs guy but i love the rare games when the dice go your way and your well oiled tactic prevails. People call it an auto-tie mission because it can be easy to force a tie. 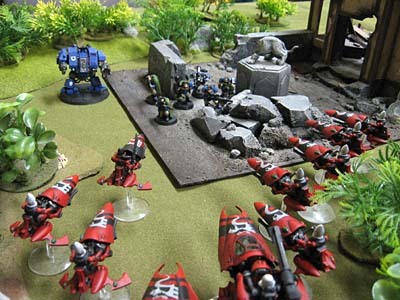 Some players see the opponents army and if they feel it is too difficult for them to beat, they play for the tie. Which is really easy to do in Capture and Control. You castle up on your objective and play a defensive game. Some players have completely given up on the missions in the book. Annihilation is unbalanced, Capture and Control is easy to force a draw, and Seize Ground is too easy to win with last turn contesting. Personally I'd rather play missions from the NOVA Open format, or new custom scenarios like in the Battle Missions book (which I haven't played yet actually). There's another game played on a board with figures that's played at a highly competitive level, where a significant % of the games end up as draws. Even if C&C ends in a draw for you on a frequent basis, does that really mean that the mission is flawed, or just that you and your opponent are pretty evenly matched? Well, the mission IS flawed, I don't really see any way around the sad fact that an even number of Objectives lends itself to draws, particularly when they can be diagonally opposite corners whatever the deployment type. And, SoT - Chess is played on a BOARD. FourtyK uses a TABLE. That's a huge difference, as much as we use the phrase Battleboard and such - not the same. Whatever army I play C&C as, I play it not to lose, primarily. The only mission I can play to win with Eldar is Seize Ground, or Annihilation if I get really lucky. In my view, it's about time the internet wised up the moaning about KPs and focused on C&C - clearly the worst and least balanced of the 3 BRB missions. I agree that it's not an 'auto-tie' mission but rather that a tie is most likely to occur during this mission than all the others. With fewer objectives you have fewer avenues to pursue to win. Essentially there are 5 outcomes to this game (you control 2, opponent 0 - you control 1, opponent 0, each control the same, and the reverse) vs say the potential of a 5 objective game or kill points. I don't play for the tie at the onset of the game but if turn 5 rolls around and we are both still duking it out, I'll start looking at what I'll need to do if things go sour to force the tie. If I blow all of my opponents troops out of the water I know he's going to do similar and that I can expect every remaining rhino, Valkyrie, trooper to converge to within 3" of the objectives and hunker down. Sometimes you can clear them out but if you've had a turn or two of unlucky dice rolls and he's still got a decent showing of force... well I'll leave it there. Again, with so few objectives, it's a lot easier to force a draw. If you're tabling your opponent then you need to find other players closer to your skill level. I've never managed to finish this mission as a draw. I think people believe what they read on forums and don't play for the win. I play every battle thinking about how I can win the mission. If things go right then I might make a push to table them but otherwise you play the mission. I think most people just want to play annihilation. It's like online video games. People just want to play slayer or whatever its called in each game and the objective games get ignored. I couldn't agree more about the bubble thing. I hate being told that unit x is worthless or that unit y is awesome. All mathammer arguments are totally specific to a particular situation. This is why people can't play objective games because they're always thinking about killing off their opponent. Obviously you have to play the odds but sometimes you need to go for it and hope you get lucky! The issue with C&C, I find, is the ease with which objectives can be contested. Being able to park any old thing on an objective and render its presence moot tends to mean a lot of empty transports racing toward the enemy objective on the last turn and parking there, hoping for the best. That said, I did see someone win 'the draw mission' the other night (that's twice I've seen that happen in fifth edition!) and I've often been able to fight my opponent down to the point where their objective is clean of troops from either side and they only bag their draw with a spare vehicle rushing in and praying I can't take it down (which happens to occur more often than I'd care to admit). While I DO call this the "auto-tie" mission, it really isn't. I have won this mission, lost this mission and tied this mission on many occassions. I will say this mission has the most POTENTIAL to be a tie when compared to the other missions in the book... but it certainly isn't a forgone conclusion. I watched 2 games at our get together this past weekend and they both ended in ties. I really think it's a matter of forgetting the mission objectives. I watched a Trygon deep strike on the other side of the board far away for the opponent's objective and I really just didn't get it. I think people play to missions in the last turn. Slightly off topic, I think the current missions in 40K are kinda a joke. I really hope that when 6th Edition finally rolls around, we get the same love that WHFB players got and get at least a dozen missions. How many times can you play the same few missions? That's why I love Battle Missions. If you play this mission to win, I believe that it will often end in a draw. People will either secure their fire base up front, to not do so is silly, you have 2 objectives and 1 of them is closer, so of course you will take that objective first. Next you don't want to make it too easy for your opponent to take the objective you already have, so you need to dedicate enough resources to adequately defend it. The other part of your force must then try to at least contest the other objective. However as there are no other objectives, it is likely that your attacking force will meet the opponents attacking force somewhere in the middle. Deciding where that position is is vital to you winning. If your defensive force is able to support your attacking force and your opponents defensive force, you are likely to come out on top. Similarly, if it is your attacking force against your opponents attacking force + defensive force, you are likely to lose. This desire to fight the battle on favourable terms can encourage defensive behaviour. This is a poorly designed mission that encourages a tie even when "playing for a win". Sometimes one player will make a mistake or get lucky/unlucky with the dice and an outcome will be achieved, but more often than not, this mission will result in a draw in 2 well rounded forces played by 2 good generals. The other 2 missions don't suffer from the tendency towards a draw as there are multiple objectives which draw forces out in multiple directions or the objectives are moving around (in KP missions). Just kidding, but you know how when you've played chess many times against the same people, it becomes something you wish that would just go "auto-tie" becomes it's not interesting anymore. the last time I played this mission was wolves against dark eldar, 1750pts. the game ended in a draw but only because he parked a venom on his objective and it just would not die despite the meltagun, powerfist, wulfen and krak grenades I was throwing at it! I pretty much ignored my own objective in this game as my long fangs were on it and they got shot down by venoms and chopped up by vect and incubi. My 3 squads of grey hunters all went up the field and pretty much demolished anything in their way (except the thrice cursed venom of course!). I would have won if it wasn't for the venom as he only took two 5 man squads of warriors in venoms as his troops as they were all dead). Still, despite the result, it was a good game and fun was had by all. Dave: But you didn't start the game going for the draw did you? Sounds like you were looking for the win with everything you were throwing at the Venom. I think you've hit it on the head though, the game was fun and in the end, that's the important part. If you're going to spend a few hours on a game, you should enjoy it. I know this is an old post that I've wandered into, but I have a response. I think the trouble is that 40k - and most wargames - encourage thinking in a bubble because list building is done in a bubble. If you're going to decide what to play - and for that matter, what to buy, and how to build it - in a bubble, you're going to generally think about the game in terms of your own list, what it can and can't do, and not the situations (opponents, missions) you will play your list in. I don't think there are any games that use some kind of "dynamic" list building, where you are expected to show up with a bunch of models and there's some structure for building your list at the table with your opponent. Privateer Press games come a little closer to this dynamism for two reasons. Firstly, the games are much smaller, with fewer models that can be reused within factions, but across multiple play styles within that faction. Secondly, each purchase is a separate entity that is played as is, rather than a toolbox that you can use to build a variety of models... but a toolbox that (usually) gets committed to one or another model and can't be reused without hacking it apart and trying to rebuild it. In other words - I think the problem is inherent to the way 40k plays. Mark: Quite alright to toss your two cents in at any time. You may be right as well. I know I build a list in a bubble as it were. Even if you're considering your local "meta," that could be thought of as a slightly bigger bubble as well.